ISIS OR ZION; WHO WANTS TO RID JERUSALEM OF CHRISTIANS? One really has to wonder who the real culprits are …. “ISIS soldiers will work to kill these people so this country is clean of them,” leaflets state. 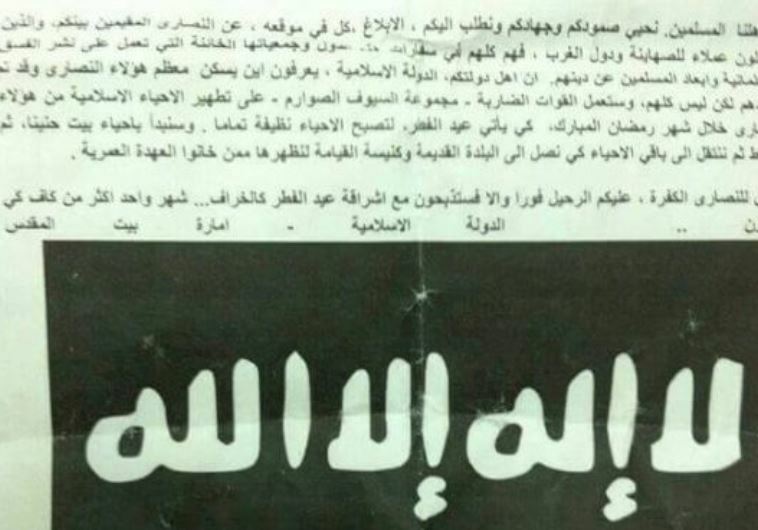 Menacing Arabic flyers, purportedly issued by an Islamic State branch in Jerusalem, threatened Christian Arabs over the weekend with slaughter unless they flee the capital by the end of Ramadan. While the authenticity of the leaflets, which bear the Islamic State insignia, cannot be verified, they called upon like-minded zealots to identify “those who collaborate with the Zionists” and provide their addresses. A police spokesman on Monday said that he was unaware of the leaflets, which were clandestinely distributed roughly one week after a church by Lake Kinneret was set alight in an apparent hate crime. It added that the group’s operatives will begin their search in the Jerusalem neighborhoods of Beit Hanina, Shuafat, the Muslim Quarter of the Old City, and the Church of the Holy Sepulchre. “Because the Christians violated the Pact of Omar [made when Muslims conquered Jerusalem], we will do this,” the note concluded. “So we tell our Christians and the nonbelievers: Go away now or you will be killed when the Id [al Fitr festival ending Ramadan] is near. While no Christian Arabs who received the note agreed to be interviewed, one Israeli man with numerous Arab friends said the vitriol has rattled some within the community. “They’re fearful for their lives and don’t want to go to the police because they feel that the police won’t be responsive,” the man said, requesting anonymity. “What’s most problematic is that in this case individuals aren’t being targeted but an entire group, which is pretty darn serious,” he continued. Noam Ivri and Seth Frantzman contributed to the translation of this document. Yeah right. 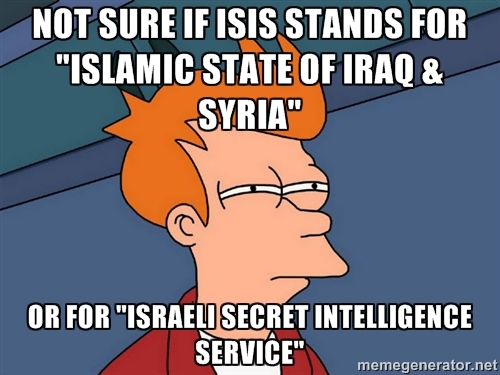 ISIS is going to attack Israel for the very first time ever… not bloody likely. ISIS’s Israeli/USA handlers are getting desperate but not quite this desperate. Just like all the BS hysteria about a July 4th attack in the States… it ain’t gonna happen. They know that too many people are watching everything they do.